If you like what you read, then subscribe to our feed! 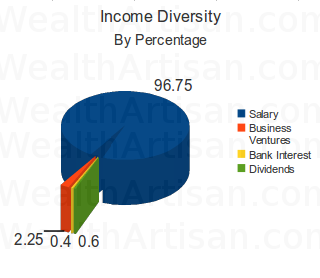 One of our first articles was about diversified income streams. If you’re not sure what that means, then here’s a quick run down. 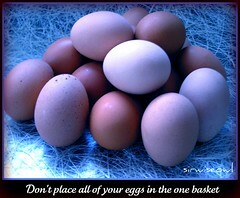 Have you ever heard the phrase “don’t place all of your eggs in one basket?” People try to avoid this all the time, except with their income. Too many people depend on one stream of income! There are many ways to diversify your income! Much of it involves investing your actively earned income (such as salary from a job) into stocks, bonds, savings, CDs, or any number of investment options. You can also have a side business or venture. Rental income, online properties, affiliate and advertising revenues are other streams of income that you can use. As you can see, if I lost my job, we would have a lot of issues trying to just live off of our income. This means that we would need to start eating into our savings to float ourselves until I found new employment. The point of income diversification is to cushion the blow of a lost job, or any other reason for an income stream running dry. There are a lot of different ways that people make money, and there should always be a hedge if a stream runs dry. All of the above options can happen and have your income stream run dry, but if you diversify your income, then one stream going down won’t hurt you as badly! Now, I know it’s ironic for me to be preaching this even though I’m in the situation that most are, but I’m also going to be transparent and honest with you. Even though I’m not where I want to be, the message doesn’t change, you need income diversification. In my New Years Resolutions post, I said that I would provide more personal examples and this is one of them. Here is the important part though: will I allow things to remain like this? No. There is no way on Earth that I would allow this diversification to remain in its current state. I’ve already set a target goal for my income to only be 90% of my income share by the end of this year, and I’m working diligently to make that happen. So, there you have it. That is just one of the pieces of analysis that I’ve pulled against my income for the year of 2010. Does it make me a huge geek for being excited about a year ending so I can get the annual statements? Let me know in the comments! Great post. it reminds me of “The Cash Flow Quadrant”, Kiyosaki, and the forms of income diversification with emphasis being put on the “passive” income. I have had a side business of one form or another for almost 30 years and been fully self employed for the last 11. Income diversification is critical when self employed but another critical piece of the puzzle, which you covered in a post last year, is living within your means-which to me means “debt free.” If my SE income starts to crumble-which is doubtful right now since the majority of my income is residual and growing (But it can happen, I don’t live in a fantasy world)-not having any “payments” (Credit card, car, house etc), I would not be devastated, but have time to regroup and replace that income. Great post-you do such a great service for those that take the time to read and put into practice. Thanks for the mention. I have now added you to my blogroll on SaveGreenTeam.net because my team can benefit greatly from your posts. Thank you for your service. I’ve linked your site on my Great Sites list and gave it a bold link ;). I love the graphic you posted. Most of the people would be in your situation or worse but you know what, at least you are doing something about it. I as well am looking to diversify my income stream! That’s what I want to demonstrate to people. I know a lot about finances and feel very confident in my ability to manage money, but there is always an area where you can improve. I want to be as transparent as possible and show my readers that even I have goals that I need to be striving towards. Thanks for coming by! You have touched on one of the reasons I chose to start blogging which is diversity of income. The other reason is I like it. Reflecting on your choices is a good thing, now take action. Absolutely! I’m going to do my best, and one year from now I’ll post another analysis hopefully showing that I’ve exceeded my goals! Thanks for stopping by and the best to your diversification goals. I’ve had all that happy to me online, and had a late tenant before. It’s tough, but you roll with the punches. That’s just it. you roll with the punches and try to not be surprised when it happens. I COMPLETELY agree and I love the graph you created so you can compare it at a later date. Do you have an older one we can see? This is the first one I’ve made, but I don’t suppose it would be impossible to make one from last year’s data. I imagine that it will all be about the same being that income diversity is fairly new to me in application. This is a good blog. Keep up all the work. I too love to blog. This is great everyone sharing opinions.